Earlier today, Apple released the third beta of iOS 7.1 to developers, which included both bug fixes and a number of visual changes that give several aspects of iOS 7 an entirely new look and feel. For example, the Phone dialer has been revamped with new buttons and several icons have had their color toned down, making iOS 7 less neon. We've rounded up all of the visual changes that have been found in the iOS 7.1 beta thus far, creating an overview of what iOS 7 might look like in just a few months if the revisions make it into the final public release. Keyboard: The keyboard in iOS 7 has been slightly revamped, adding a slight boldness to the font and a new design to the delete and shift keys. It also incorporates a somewhat darker, less yellow gray tone. Overall, the keyboard changes have the effect of adding contrast and making the letters easier to see. 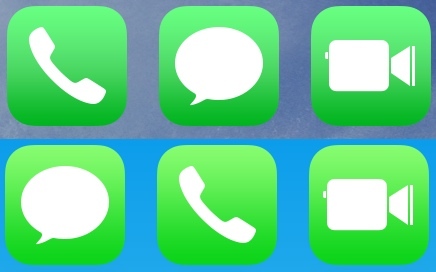 Icons: The green color in the Phone, Messages, and FaceTime apps has been toned down and is now darker, especially at the bottom of the icons. This introduces a less neon coloration to iOS 7, cutting down on some of the operating system's brightness. Phone: The Phone app has seen the biggest changes, with a renewed focus on simple, circular buttons. 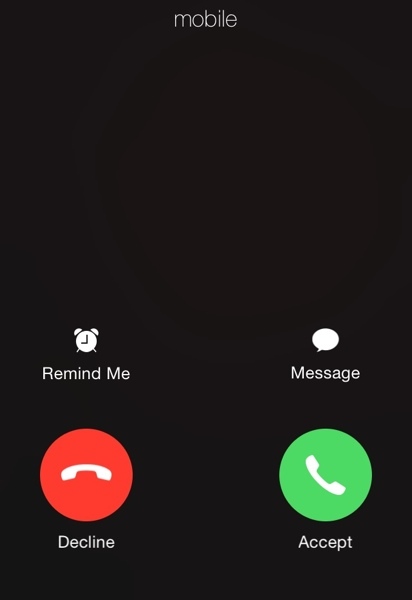 The standard incoming call screen with rectangular buttons has been replaced with a black background and two round Accept and Decline icons. 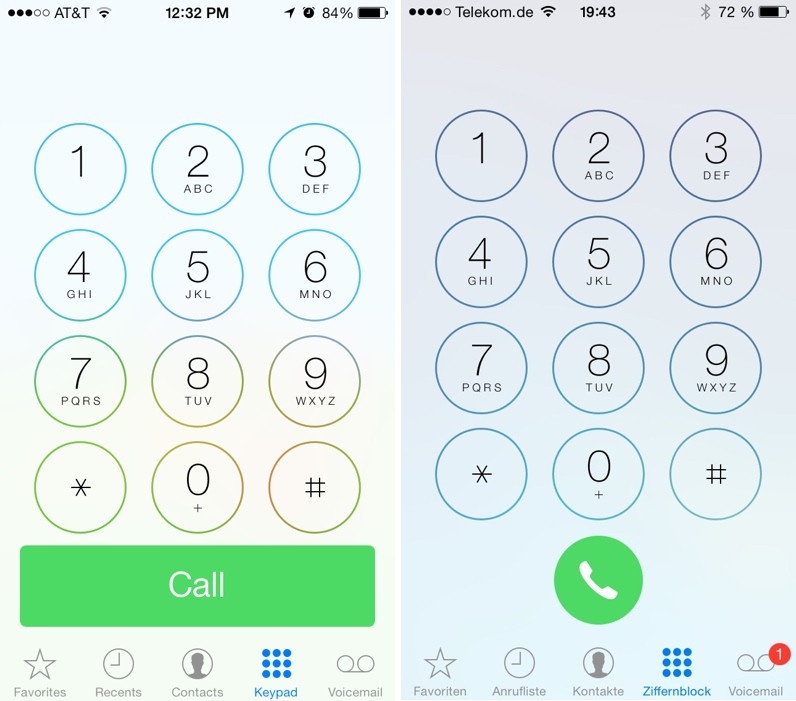 The "Call" and "End" buttons visible on the dialer have also been replaced with circular icons. Wallpaper: When selecting a new wallpaper, users can now choose to turn the parallax effect on or off. Control Center: Control Center's brightness and volume sliders now maintain momentum when they are flicked, a new feature that fits in well with a previous bounce animation added in iOS 7.1 beta 2. 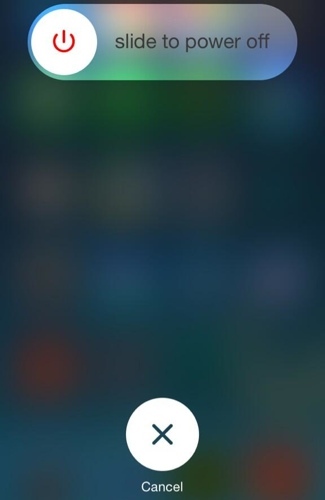 Shut down: The power off screen when shutting down the phone has a new look that does away with the red "slide to power off" and cancel tabs first introduced with iOS 7. The new design includes a power button icon at the top and a cancel icon at the bottom. Accessibility: A New option has been added in the Accessibility's Contrast menu, allowing users to reduce iOS 7's white point. This feature joins both the "Button Shapes" and Darken Colors options that were added in an older iOS 7.1 beta. Music: The Music app has new shuffle and repeat buttons that are more prominent, and iTunes Radio has a revamped "New" button. According to a recent report from BGR, iOS 7.1 may not make it to consumers until March, indicating that the software will see a lengthy beta testing period. Beta 3’s release notes indicated a number of known issues that remain with iOS 7.1, suggesting that the update is not yet ready for the public. Everything else is ok though. REALLY hate that shut off screen, very horrible to look at, looks like a cheap/rushed theme. get back to me when there's some news on stability and usability. seriously? a slightly different hue of green? unreal. seriously though these changes are so minor it's a joke. Apple needs to take a cue from Google and push larger changes on a more frequent manner. Redesigning the entire operating system apparently isn't "big" enough. While Google's been sitting on Android 4.X for years now. Yep, you're so totally right. Not saying 4.1-4.4 haven't included some neat features, but they've slowed down substantially since releasing 4.0. Mainly because they found a good design and didn't want to fix something if it wasn't broken. You know, kinda like Apple did from iOS 1-6. And now that they HAVE done a substantial overhaul with an entirely new design personality as well as some substantial and incredibly powerful new APIs, you're saying Apple isn't "pushing larger changes"
Steve Jobs was known to call people in the middle of the night to complain about the subtlest issues with colors and icons etc. Sure doesn't seem like there is anyone on board with that attention to detail anymore. So many questionable design choices. Call screen is kind of... weird? looks unfinished. The "cancel" button on the "slide to power off" screenshot reminds me of the X from mavericks during the install process.